Features a slimmer fitting leg for a clean, professional look. They sit at the waist and have slightly tapered legs. The full elastic and drawstring waist allows for a more comfortable, secure fit. There are a total of 6 roomy pockets including: 1 right cargo pocket, 2 side pockets, 1 back pocket, and 1 left double cargo pocket with pen slot. 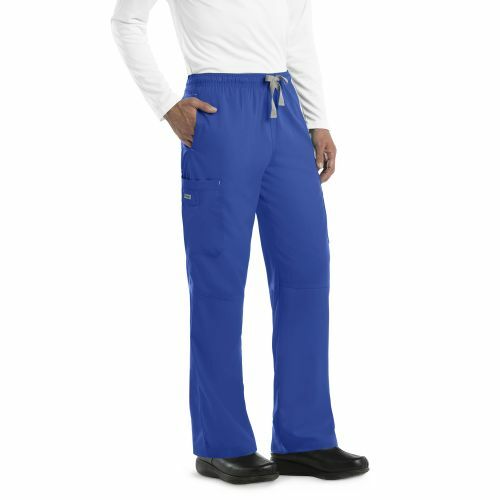 Approximate inseam - size L - 32"
The Grey's Anatomy 0212 men's "Derek" scrub pants offer a slimmer fitting leg for a clean, professional look. They sit at the waist and have slightly tapered legs. The full elastic and drawstring waist allows for a more comfortable, secure fit. There are a total of 6 roomy pockets including: 1 right cargo pocket, 2 side pockets, 1 back pocket, and 1 left double cargo pocket with pen slot.